This antique oak pedestal desk is made from beautifully figured quarter cut English Oak. Recently benefitting from Professional sympathetic restoration the desk has a lovely honey colour and rich patina. Professional polishing has highlighted the the decorative qualities of the oak ​and the beautiful medullary rays which are evident throughout. 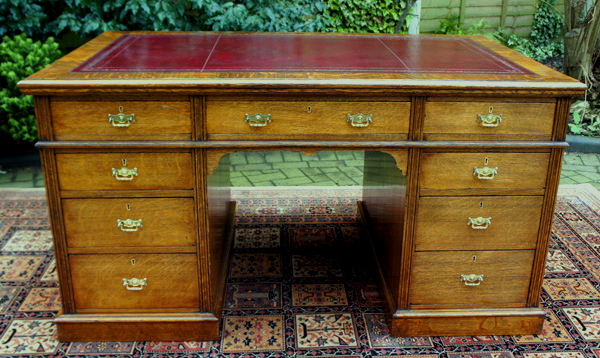 This handsome antique oak desk is polished all round so that it can be used as a free-standing piece facing into the room if required. Recently benefitting from Professional sympathetic restoration the desk has a lovely honey colour and rich patina. and the beautiful medullary rays which are evident throughout. 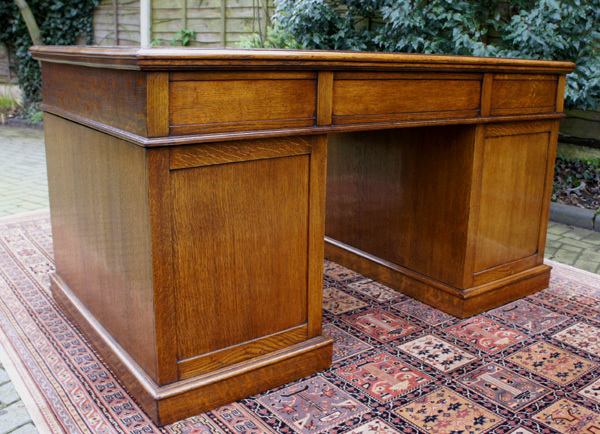 This handsome antique oak desk is polished all round so that it can be used as a free-standing piece facing into the room if required. The top is fitted with a burgundy writing leather with gilt and blind tooling. This is surrounded by a band of solid oak with a 'bulls nose' moulded edge and square corners. The frieze is fitted with three drawers and each pedestal has three drawers. The drawers are deal lined with hand cut dovetail joints, the original locks and brass drop handles. They stand on plinth bases with hidden castors with panelled backs and a decorative arch above the knee-hole. As with all genuine pedestal desk it is constructed in three sections (top and two pedestals) for ease of movement and installation. 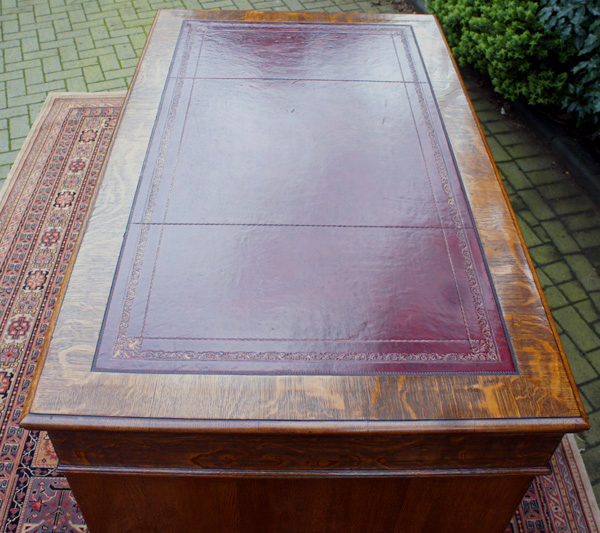 This is a fine quality original antique desk that would look stunning in a traditional or contemporary setting.